It is noticed that the images of Europeans among Africans as well as the images of Africans among Europeans are both unfairly wrong and falsely negative, almost all of them were fabricated. These perceptions were created by the same parasites who damaged and controlled Europe and Africa, and the world. They manipulated and used corrupt politics, media and academia to invent false assumptions and accusations between Africans and Europeans. Their aims are to maintain animosity and hostility, and make Europeans feel guilty for crimes they did not commit, while whitewashing their own image. EAST is a public political group created by few proud Africans to encourage understanding and cooperation between African people and European people from all over the World. EAST admires and promotes true history, values, and achievements of Africans and Europeans. The main topics of EAST are politics, history and current political affairs. EAST is against the strategy of “Divide and Rule”. The objectives of EAST are: to dismiss myths, prejudices and misconceptions created by corrupt and ignorant politics, media and academia, from within and from without, about who the Africans are; who the Europeans are; what really happened in African and European histories; the common values of cultural integrity and national sovereignty; dismiss allegations of racism, slavery, and colonization of Europeans towards Africa; revise world history to discover the true history of Africa and Europe. EAST is against liberal globalist policies of fast multiculturalism, cultural decay, abuse and misuse of migration and refugee systems and principles. The present threats of New World Order and globalization are in cultural and political liberalism; attack on REAL Democracy; debts; mass migrations; the struggle between “protection” of transnational corporate (TNC) rights versus the “freedom” of democratic governments to regulate in the interests of domestic non-corporate constituencies. While encouraging tolerance, understanding, peaceful coexistence and natural multiculturalism EAST is strongly opposed to massive aggressive and imposed multiculturalism and criminally-organized refugees and migrations. EAST supports regulated humanitarian assistance for refugees fleeing wars, poverty, and persecutions first in their neighboring countries, then by dignified, organized and lawful relocation to other countries if necessary and possible only. Refugees and migrants shall not be used as sources for cheap unprotected workers; or to sap Africa or Europe from its human resources, cultures and talents. Humanitarian assistance shall not be used to harm the sovereignty, security and order of any African or European country; and they shall never be used as weapons of extremism or terrorism or implanted political caucus against any country. EAST is in its humble beginning and the future plan is to widen the coalition gradually by including Asians (including the Arabs) and the Native Americans. EAST’s motto is “Africans and Europeans are Stronger Together”. Therefore, EAST does not tolerate any bashing, misinformation, or bias against Africans and Europeans equally. Only good quality articles from any source shall be approved for posting on EAST. The rules of polite discrete conduct are paramount. Any offensive language or materials are not allowed. 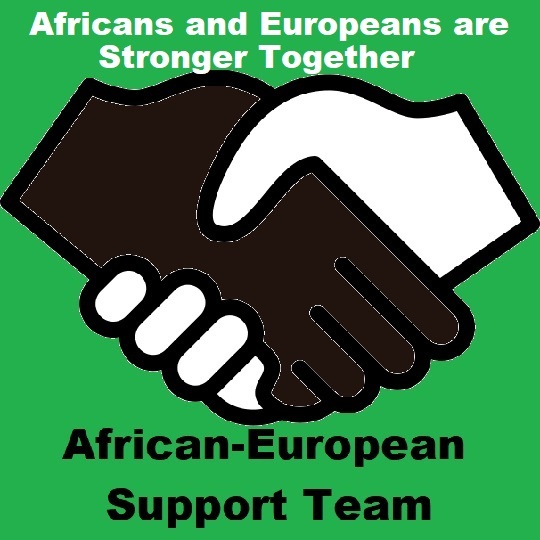 If you share EAST’s vision and objectives be a member and participate to encourage strong Africans-Europeans cooperation and to create mutual support between Africans and Europeans. It is planned to develop this project to become a website and later on a fully functional organization. Ideas and suggestions are most welcome and essential specially now to make a strong and successful start. 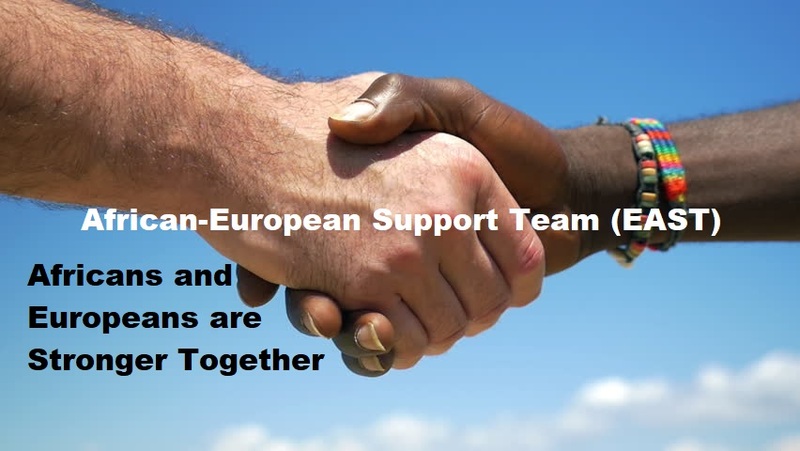 Contact us at African-European Support Team (EAST).